The Future of Medieval Science? King underscores a point he has made forcefully: medieval instruments and the texts that describe them offer rich sources for understanding medieval science and society more broadly. He calls for a “catalogue of the entire corpus of surviving medieval insturments … and a survey of the related literature.” Part of his catalogue has been realized by Catherine Eagleton’s book on navicula. He lets Lynn White’s three theses—technological roots of the agricultural revolution, the possibility of a medieval industrial revolution using water power, the origins of feudalism in the stirrup—structure his survey. I was surprise not to see, inter alia, magic, medicine, and occult sciences. The “Textual Genres” section again gives the impression that only a few of the sciences occupy only a small place in medieval studies. Maybe bestiaries, charms, cookbooks, and lapidaries are trendy. Griffin’s entry on scientific texts approached them as either artes liberales (theoretical) or artes mechanicae (material). It is unclear why these poles were chosen to characterize texts. It is equally unclear how all sorts of other texts, e.g., astrology, demonology, encyclopedias, instruments, magic, medicine (which are not explicitly the topic for other entries), fit into this scheme. Most of the authors called for more and better critical editions. Most of the authors were not historians of science. The first of these issues seems incredibly traditional, if completely defensible. The second seems to reflect what I noted yesterday—that scholarship on medieval science is moving out of traditional history of science and into all sorts neighboring disciplines. She characterizes Richard Kieckhefer’s Magic in the Middle Ages as descriptive rather than analytical. Nancy Siraisi’s Medieval and Early Renaissance Medicine (1990) is also cited as useful for understanding the shift in medical practice after the “reception of Greek science, Ptolemaic astronomy, Aristotelian logic, epistemology, cosmology and physics.” I wonder if she is expecting too much from textbooks—Kieckhefer is less interested in providing a monograph on lapidaries than a handy text on all of medieval magic aimed at undergraduates. Isabelle Draelants work on encyclopedias and lapidaries is held up as exemplary: I. Draelants, “Encyclopédies et lapidaires médiévaux: La durable autorité d’Isidore de Séville et de ses Étymologies” Cahiers de recherches médiévales et humanistes 16 (2008). He surveys a wide range of types of pharmaceutical literature that awaits scholarly attention (some of which don’t seem initially like pharmaceutical literature): amulets, animals, antidotarium, Arzneibuch, astrological herbals, calendars, compendia, compound medicines, diet, electuary, formulary, herbals, materia medica, pharmacopoeia, poisons, recipes, theriac. Griffin stresses the continued need for more and improved catalogs and critical editions of texts. She cites the enduring value of Lynn Thorndike’s and Thorndike and Pearl Kibre’s A Catalogue of Incipits of Medieval Scientific Writing in Latin . She also highlights need for additional textual studies on medieval technology. Connects the history of world maps to traditional scholarship, dating back to the 18th and 19th centuries. He discusses classification schemes, periodization, the geographical framework, and the function. Particularly for the last two topics, Schnall situates his discussion in modern scholarship. He summarizes the last three decades as a shift toward symbolic and narrative functions as well as towards a theory of cartography. These chapters were often dense and technical, e.g., Edward Grant’s chapter on cosmology includes a table showing the radius, circumference, distance of convex and concave surfaces of planetary spheres from the center of earth, and the thickness of the spheres—fyi, it’s 73,387,747 miles to the concave surface of the sphere of the fixed stars (ugh). Clearly, scholarship on the history of science has changed. The ISIS Critical Bibliography should, perhaps, be supplemented with a look at recent dissertations. While the ISIS Critical Bibliography includes some, I turned to ProQuest for what I assume will be a more complete picture (and crosschecked ProQuest against the University of Pittsburgh Medical Humanities Dissertations, which would really benefit from a search function). 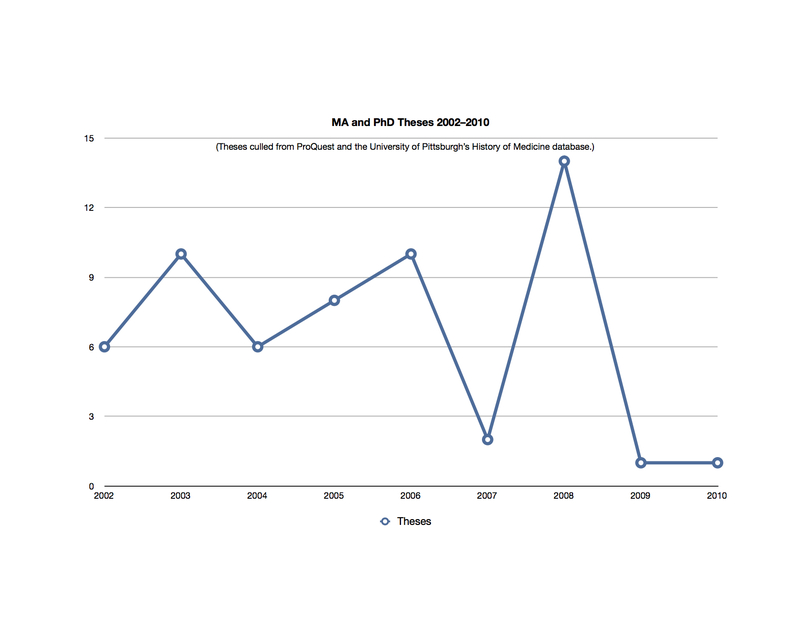 Over the last decade—actually, the last two years are not readily available, so they are not included—58 students at 40 different institutions completed MA or PhD theses. Although training at the graduate level is spread across a wide number of institutions, Chicago, Harvard, and Yale account for 12 of the theses produced. To arrive at these numbers I considered the categories “medieval” and “science” or “medicine” or “technology” very broadly (a number of theses included here would not be classified as “medieval” in the ISIS Critical Bibliography but would be considered “non-Western knowledge”). While students worked on all sorts of topics, religion, medicine, and astronomy/astrology attracted considerable attention. 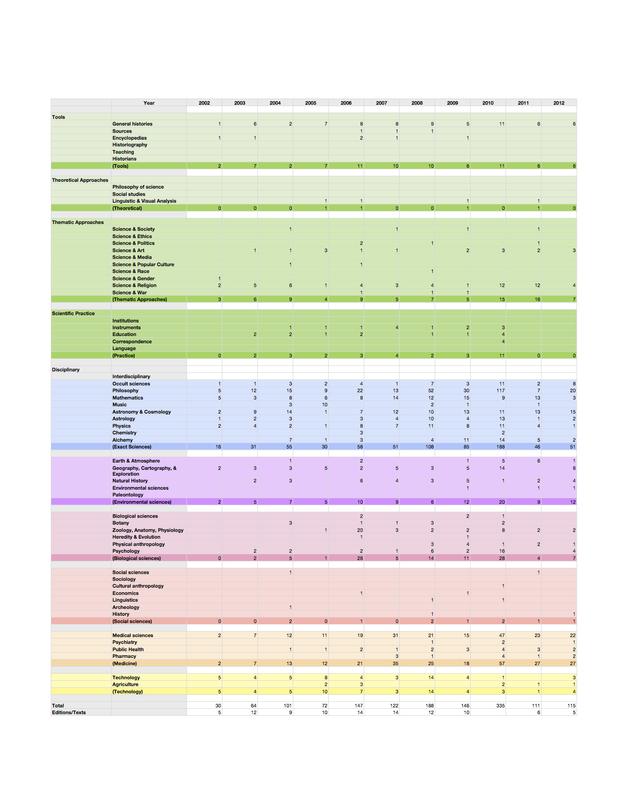 A totally useless graph showing the number of theses completed each year from 2002-2010. 58 theses in a decade seems promising enough, but I wonder if that number misleads us about the health of History of Science as opposed to the interest in history of science. Most of these theses were produced by students in neighboring departments—e.g., literature, religion, philosophy, political science. On the one hand, I see that as a positive development—it indicates that past sciences are both interesting and considered relevant. On the other hand, as a historian of science, I worry that it does not bode well for the future of the history of medieval science—I don’t want to see the history of science colonized or cannibalized by other disciplines. I, perhaps naively or mistakenly, think training in the history of science as a discipline brings with it an expertise that is not equivalent to and therefore cannot be exchanged for other forms of expertise. Unfortunately, it does not include in this chronological listing pre-1800 scholarship that has been listed under a heading in the “Disciplinary Classification,” e.g., “Astronomy,” or non-Western knowledge, e.g., “Medieval Byzantine contexts” (as a side note, in 2002 the ISIS Critical Bibliography , moved Byzantium out of the chronological listing and now considers it a “non-Western knowledge tradition”). Of the material listed in the chronological section, scholarship on medieval science has hovered around 3-5% of the works listed. 2010 is the outlier here, with over 300 items listed for about 10% of the scholarship. Each year medievalist have produced about a dozen editions or translations of medieval texts. 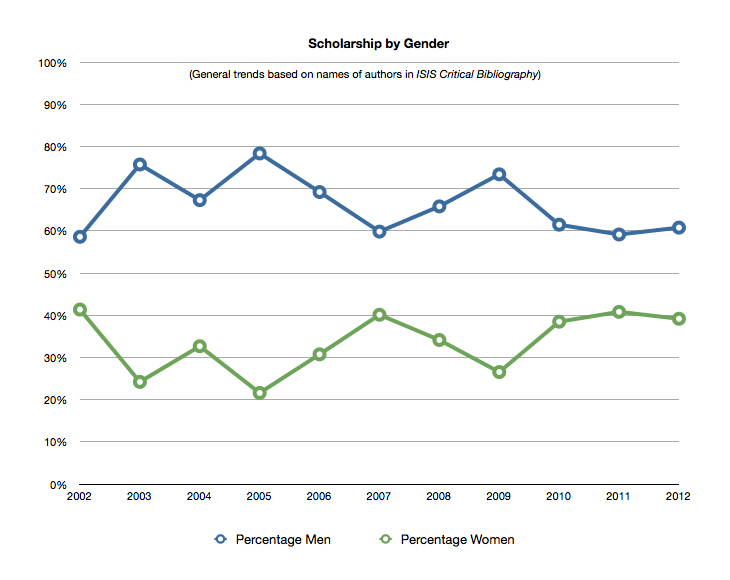 Scholarship by men outnumbers that by women, though probably not by too much. The information for the graph below excludes a number of items where I did not know and could not determine quickly whether the author was a man or a woman. Approximate gender distribution of scholarship on medieval science. As with yesterday’s post, this one should not be taken as definitive. I culled the information from the main entries in the ISIS Critical Bibliography . I did not include any information from the contents of collections—a number of items in the bibliography are collections of essays—nor did I work terribly hard to figure out if authors were men or women. And obviously, I don’t know how much scholarship the ISIS Critical Bibliography misses each year. In the NY Times we read about the proliferation of “pseudo-academic journals” that charge authors to publish articles: “Scientific Articles Accepted (Personal Checks, Too).” Open access, we are told, is the root of this pseudo-academic underworld of pay-to-publish and pay-to-present science. But page fees are common in scientific publishing and predate open access. Both reputable and disreputable open access journals charge authors to publish material. The “well-regarded, peer-reviewed” PLOS charges $1,350-$2,900 depending on the journal, with reductions for authors from less affluent countries. The journals and conferences referred to in the article may very well be pseudo-academic, but not because they charge authors to publish. Each pill contains 0.0448 gram, or 0.69 grain, mercurous chlorid (calomel). That Dr. Tutt’s Liver Pills contained mercury is not news. I agreed to give a short presentation this weekend on “The Future of Medieval Studies: Science.” Consequently, I find myself thinking about recent trends in medieval science and where things might be headed. As a bit of diversion, I thought I would look back through the last decade or so of the ISIS Critical Bibliography . Having spent a couple hours with it, I am reminded of just how difficult it is to organize a bibliography into meaningful subjects and areas. I fear the CB , in the interest of consistency, has imposed too many modern categories on medieval topics and too finely divided categories. Scholarly trends in medieval science, according to the ISIS Critical Bibliography (Click for larger image). There is an interesting uptick in scholarship a couple years after ISIS started using the new categories. 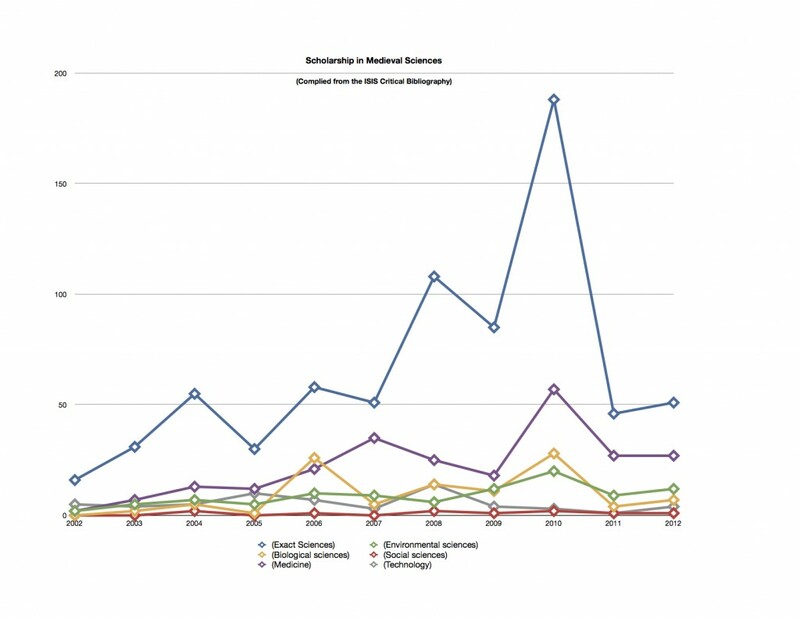 There is also an interesting spike in 2010 of scholarship in the “exact sciences.” If you are interested, here are the various categories ISIS uses to arrange its bibliography. Numbers culled from ISIS Critical Bibliography . You can download a pdf here.